The original caption: “Adolf Hitler, the German patriot in the middle of the crowd stands with blazing eyes”. The photo was taken by Munich photographer Heinrich Hoffmann at a rally in support of war against Russia in Munich’s Odeonsplatz on August 2, 1914. On the day before the election of the Reich president, the Illustrierter Beobachter published the August 1914 picture with Hitler for the first time, with a magnifying-glass-like enlargement of his face. The caption read: “Adolf Hitler, the German patriot. When on 1 August 1914 tens of thousands of deeply moved Munich citizens listened to the last notes of the band, suddenly the German anthem washed over the square. In the midst of the crowd stood with shining eyes – Adolf Hitler”. Hitler was superimposed to lend credibility to the image of the Nazi leader as a patriot and a man of the people. The photo went on to become a favorite Nazi propaganda picture, appearing with captions such as “Adolf Hitler: A man of the People”. It was used countless times in newspapers, propaganda papers, biographies and school books. Hoffmann, who was one of the founders and the main supplier of pictures for the Nazi paper, always claimed he had discovered Hitler in the photo by chance after the future Führer visited his studio in 1929. When Hoffmann was told by Adolf Hitler that he was there during the Declaration of War in 1914, Hoffman scoured and scrutinized every picture he had of that momentous day. Hoffmann then dug out a glass picture negative he’d planned to throw away and found Hitler in the image. “I only needed to search for a very short time, one standing there, yes, it’s him – his hair falls over the forehead”, Hoffmann once said. “His face cannot deceive – it was him”. Enlargement first published in March 1932. However, many researchers claim Hitler’s photographer Hoffmann manipulated the image in order to feature the soon-to-be-dictator. Research has failed to turn up the original negative of the picture. And intense scrutiny of newsreel footage has failed to spot Hitler among the crowd. Photographs of Hitler taken during the war show him with a large mustache, of the sort that was in fashion at the time. The practice of shaving mustaches down to a “toothbrush” shape seems to have been introduced during the war to allow men to wear gas masks more comfortably; the fashion was unknown before 1914. If the photograph is correct, then Hitler, almost alone in Europe, wore a toothbrush mustache in 1914, grew a big mustache during the war, and then went back to a toothbrush style after the war, none of which seems very likely. 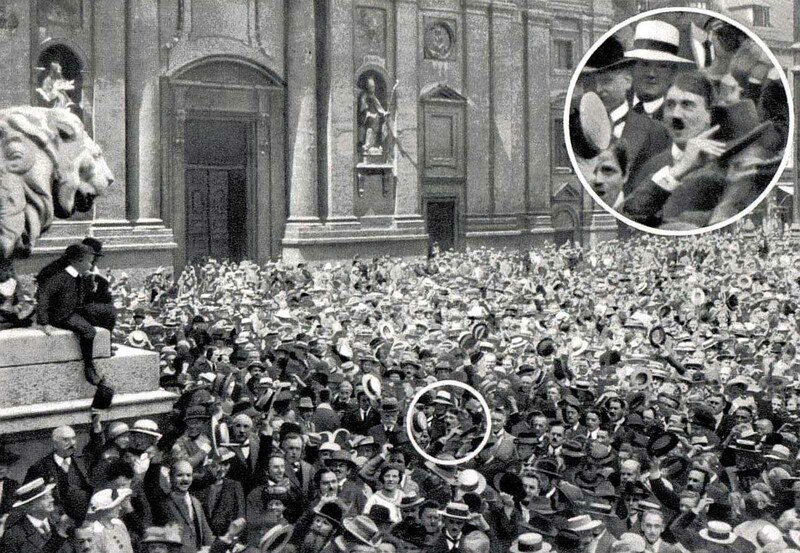 Since he was in Munich in 1914, and his presence in the crowd is entirely in character, while it is possible he was inserted into the photograph by Nazi propagandists, the most likely explanation is that the picture was retouched to make him more immediately recognizable to Germans in the Thirties. This version was published in Hoffmann’s book “Hitler wie ihn keiner kennt” (Hitler as No-one Knows Him), Berlin, 1932. Further evidence that perhaps the whole thing was faked by him and Heinrich Hoffmann can be found in the pages of Hitler’s autobiography Mein Kampf, published in 1925. He makes no mention of being in the Odeonsplatz on August 2 but does make reference to the following day, when he petitions the King of Bavaria to allow him, an Austrian, to fight for Germany. 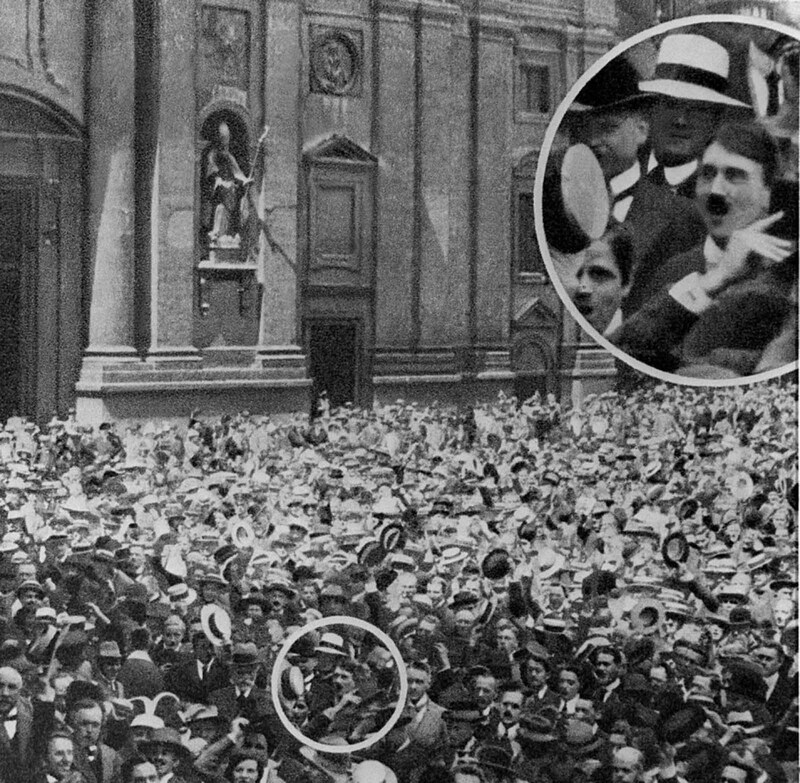 Pending definite confirmation, therefore, the photograph is probably best regarded as allegedly, rather than definitely, showing Hitler’s presence in the crowd. We see the evidence that convinced the world it is real, so where is this evidence it was faked? And other people are in the crowd, so why could Hitler not have been in the crowd? Why would the odds be against Hitler being in the crowd? Was Hitler not allowed to be in crowds? I have met many people that have showed me pictures of crowds and said "I was there, see" and they point themselves out. So Hitler was not permitted to be in crowds because he would soon be a celebrity? I'd like to see these evidences that it is not him, but all I have seen is the evidence that it is! The article actually says that it has been proven true. Most people just found it difficult to believe the coincidence that he would be found in such a random photo. And knowing how the Nazi party falsified things it was just natural for people not to believe it. I agree, show me proof that over powers conventional view about anything; UFOs, the shooter on the grassy knoll, or that 9/11 was not a terrorist attack. Without proof you live in a world that can be controlled by magic. The other reason that the authenticity was doubted for so long, as the article states, is because its publication came at a time when Hitler needed it, not before. Had the photo been published in 1914 instead of 1932 it would have gained credibility. It is clearly not Hitler. At the time he would have not had that mustache, as the mustache came along during the rise of his public political career. His advisers felt that adopting the mustache would create greater appeal with the public and create an image that stands out from others. That would make this an inaccuracy and a fake. The very fact that this website states this is real does not make it so. Matt, I agree with you totally. May I also add...we take it as a given these days that some "suspect" photos may have been photo-shop'ed. But what 99% of the population don't realise (or forget) is that faking photo's has been around since the time the first photo was taken! History clearly shows us some very impressive and well known faked glass-plate photos. The forgery is not in the original plates, The process takes place in the dark room. By using double exposure techniques, splicing separate, sometimes unrelated, photos into single images, and then photographing the print. Voila! You now have an "original and REAL" plate. HA! It makes me laugh. Don't believe me? Google it! Just look up Cottingley Fairies. You're not correct. He had that mustache before the WW1 but then when he went tot enlist, they made him get rid of that mustache because of the issues it could cause with the gas masks. Unfortunately for you, Hitler had a rather lengthy mustache throughout his service in the German army in WWI, so no, it did NOT come along during his political career. Hitler originally wore the Kaiser mustache, as evidenced by photographs of him as a soldier during World War I. Some people think he adopted the toothbrush mustache during the war after being ordered to trim it to wear a gas mask and some people think it was after the war but all historians know he didn't wear it before the war. I thought Hitler had a longer mustache at the beginning of WW1, and then trimmed it while he was in the trenches so that his gas mask would fit. There are pictures of him in his army uniform with a long mustache. This man looks like Hitler, but I don't think it's him, just a coincidence. I thought the same thing, David. This is a fake. Hitler used to have a big moustache before WWI. It was only when the gas bombs were introduced that he cut it, so that the gas mask would fit. I think it's fake. 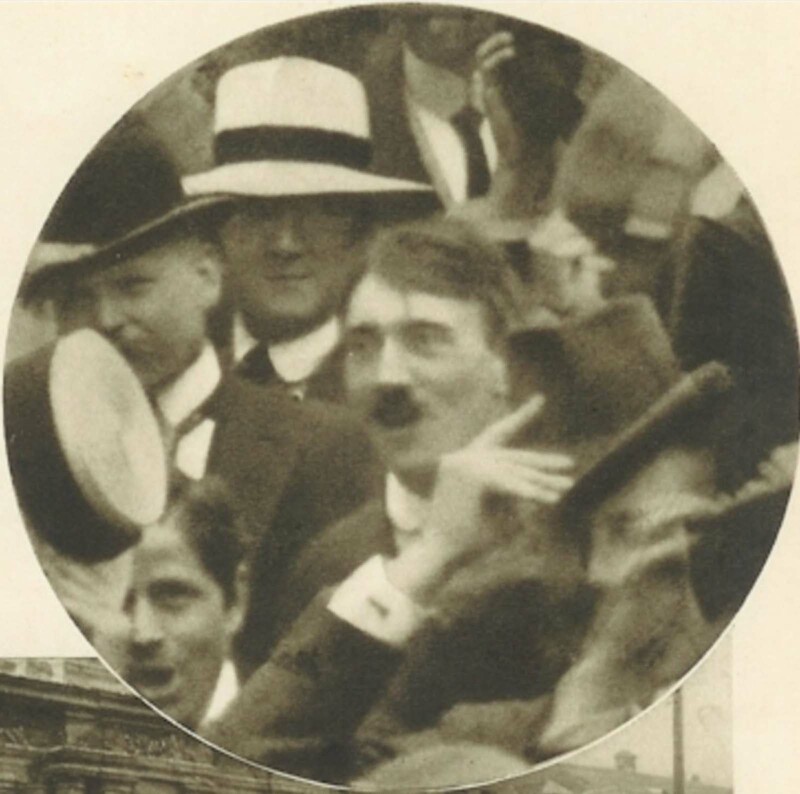 Photos of Hitler at the end of WWI show him having the "Kaiser" mustache. The "gas mask" cut is a myth: firstly being unneeded - the roots of that style of mustache are all above the lip so men simply pulled the mustache ends down with one hand as they put the mask on with the other, and then let go leaving the mustache contained in the mask. Secondly, if that cut did interfere with the seal of gas masks, EVERYONE would have that cut or no mustache at all. Very few men literally have a "mustache or die" attitude. Hitler always felt "special" or that he was "the chosen one" so it's plausible that he was wearing the clown cut (my derisive name for it stemming from Charlie Chaplins use of the cut) prior to WWI as a way of standing out from the crowd and feeling unique. The military wouldn't have stood for it so, when he joined, he had to shave or wear the "Kaiser cut". After the war, he would have returned to the clown cut. Very glad to have found this picture. This picture is referenced in Richard J Evan's "Coming of the Third Reich," and I had not seen it published. Certainly a photograph of historical significance that I am glad to see so readily available. I had also read that Hitler had a full moustache during the war and cut it to just under the nose when he was gassed and the moustache prevented a full seal of his mask to his face. However, looking at the photograph, there are quite a few men with moustaches under the nose only. To me this seems that there may have been some alterations to the original. Are there other photos of the time to prove or disprove this? This is fake. Before WWI, Hitler had one of those curley mustaches. He shaved it down to the Hitler stache we now know when his commanding officers forced him to shave it in order for it to fit in a gas mask. So he didn't have that mustache until well in to WWI.